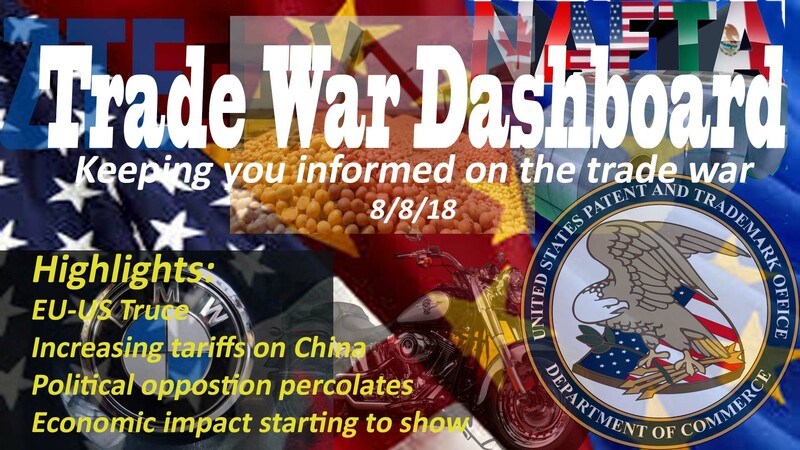 Keeping you up to date on the ongoing trade war. Links to related articles and our background videos below. EU Truce and China Pressure: The EU and US reach a truce of sorts while the US significantly increases the tariff threat against China, signaling perhaps that the focus of the trade war might narrow to China. Economic momentum definitely seems to be on America’s side as it reports strong second quarter growth while China scramble to deal with a slowing economy. Economic Impact: While it is still early and the trade war still small, initial indications of economic impact are being felt on factors like steel company profits to soybean prices. Political fall out: Lastly, political opposition to the aggressive Trump trade agenda, while not likely to overwhelm the administration’s efforts any time soon, continue to build. While trade relations with the EU aren’t perfect, China is the much bigger issue. Many think the US should unite with the EU to address China, fixing the US-EU problems via a more cooperative approach. It appears President Trump might be heading in this direction, which would be a welcome change in our view. The EU’s barriers aren’t much worse than America’s (for example, while the EU car tariff is 10%, the US’s light truck tariff is 25%), so a less confrontational approach makes sense. Plus the US should capitalize on the fact that the EU has pretty much the same position relative to China as the US. China was fairly well positioned for the 2008 Financial Crisis, with low levels of debt and plenty of room to reform the economy to support growth. Since then, China has leaned heavily on debt (debt to GDP rising from 120% to roughly 300%) and lightly on reform. The result is that, unlike the 2008 Financial Crisis, China is now not very well positioned for a trade war with its major customers. Economic momentum favors the US, for now. The reality is, what China’s trade partners want—a more open Chinese economy—is what China needs. Many in China know this. It should be the basis for a reasonable agreement. Time will tell if we get that result before a full blown trade war develops. Lastly, we likely won’t know much until after November. Reports that China and the US have re-opened discussions are good news. 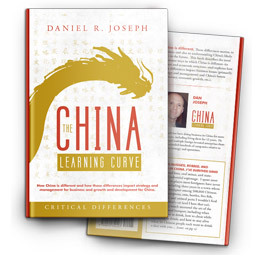 But China knows the midterm elections could change the political landscape in the US so China will likely bide its time. With any luck, even though an agreement will likely not be reached, discussions will continue that will shorten the path to a meaningful agreement. The US and EU announced a trade truce. Current tariffs, mostly steel and aluminum, will remain in place, for now. Auto tariffs are put on hold, for now. The two sides will take 120 days to formulate a framework for negotiations for a broader trade deal that would address a broad range of trade issues. Short term the EU promised to buy more US soybeans and LNG (liquefied natural gas). Hard to know if the truce will last. The Trump administration has not taken auto tariffs off the table, just delaying possible implementation pending discussions. Having enacted tariffs on roughly $34 Billion in imports from China, the US has another $16 Billion in line for tariff implementation shortly and is considering tariffs on another $200 Billion, which could take the trade stand-off with China from skirmish to war. Initial plans called for a 10% tariff on that $200 Billion. The Trump administration announced it will consider increasing that to 25%. There are reports suggesting that negotiation between the US and China have resumed. The US reported 2nd quarter GDP growth of 4.1%, highest rate in more than 3 years. Increasing exports were part of the story, though much of that could be a temporary impact of products, like soybeans, being shipped early to avert tariffs. Beyond exports, given the recent tax cut and other variables, there is a good chance growth will remain strong over the short term. China’s growth is being dragged down by the debt binge of the last ten years. China had planned to address the debt problem by tightening bank lending and other measures but has announced it will prioritize stimulated growth over debt reduction, a sign that China is increasingly worried about it near-term economic outlook, particularly in light of the growing trade conflict. It would be an overstatement to say that the Trump trade agenda is facing an intense political backlash. But opposition continues to percolate, including from Congress, business groups, and political organizations. For example, the announcement of $12 Billion in aid to help farmers was greeted with more than appreciation by farm groups concerned that limited relief can’t possibly compensate for lost sales. Trade might yet be a key issue in the mid-term elections. Exports increase, but deficit grows: While strong exports are part of the reason behind the US’s strong 2nd quarter GDP growth rate (4.1%), in June the trade deficit actually increased. Again, it is still early, but since the Trump administration has identified the trade deficit as a huge negative for the economy, over time the impact on the deficit is likely to be seen as an import indicator as to the success of the trade agenda. Steel company profits increase: Steel companies are reporting better profits which are at least in part due to tariffs that have produced higher prices. Soybean and copper prices falling: Perhaps the industry most directly impacted thus far is soybeans, which China imports in large quantities and which China has targeted for retaliatory tariffs. Prices in the US are falling as farmers look to get rid of product before tariffs take effect. Other commodity prices, like copper, are also decreasing, possibly related to trade war fears. Qualcomm Deal Killed by China: China’s anti-trust authorities refused to approve Qualcomm’s acquisition of NXP, leading Qualcomm to drop its bid. This could be a precursor for the kind of non-tariff actions China could take as retaliation for US tariffs, a tactic China might apply because it imports less from the US than it exports to the US. This issue may have been one of the reasons the administration elected to increase planned tariffs on China from 10 to 25%. Factories moving out of China: If the US hits China with additional tariffs, one possible impact would be for both foreign and Chinese companies to move production to other countries, quite possibly other low-cost Asian countries. Preliminary reports suggest this type of activity might be increasing already. It is still very early but this could be another critical impact of any trade action—China loses but maybe no jobs return to the US.